This spectacular heart shaped gift is the ultimate romantic gift for any cheese loving couple. Whether you are looking for a unique gift idea for Valentine's Day, a wedding gift, or a romantic birthday or anniversary gift - this is the ideal guaranteed to impress. 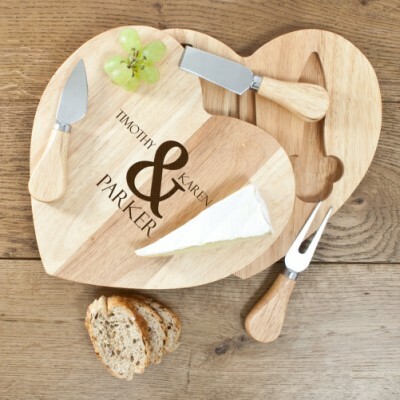 This heart shaped cheese board is beautifully made with top quality sustainable Hevea wood. To add that extra special touch, the cheese board can be personalised with both of the couple's first names and their surname. This stunning necklace is the perfect anniversary gift and can be personalised with two initials, an..